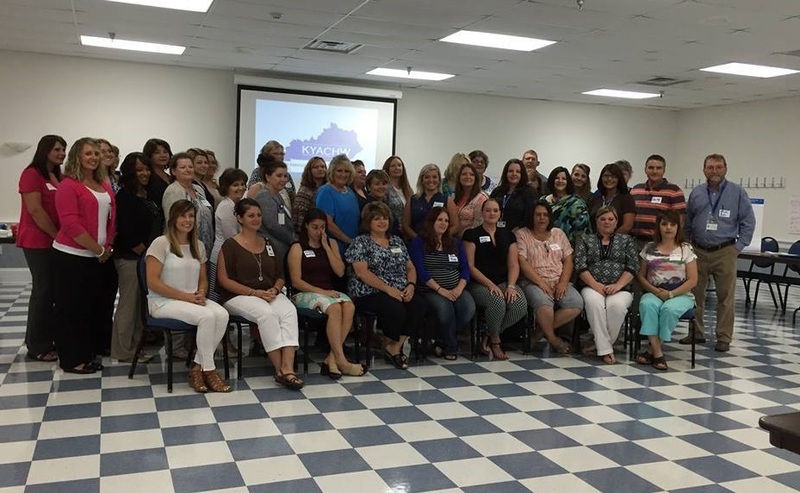 Participants attend a recent meeting of the Kentucky Association of Community Health Workers (KYACHW). The Appalachian Kentucky Health Care Access Network, or AKHCAN, played a key role in getting the association established. The mission of the Appalachian Kentucky Health Care Access Network is to increase the number of Community Health Workers (CHWs) in the Commonwealth of Kentucky by expanding our network to include partners throughout Appalachian Kentucky and developing training programs and supporting a certification process of all CHWs. By increasing the number of CHWs, Kentucky will provide better healthcare access for their low-income, uninsured, and underinsured rural and Latino populations. The AKHCAN vision is to increase and improve healthcare access for all low-income, uninsured, and underinsured residents, documented and undocumented, of rural Kentucky. Jan Chamness and Gina Brien of the Appalachian Kentucky Health Care Access Network were interviewed by NCHN’s director of member services to share information on the network’s characteristics, key learnings, accomplishments, and challenges. A: Our network exists to promote use of community health workers (CHWs) and expand the use of CHWs in Appalachian communities. We have an executive committee of 12 and a full membership of 22, comprised of local health departments, the state department for public health, hospitals, FQHCs [Federally Qualified Health Centers], the University of Kentucky’s Center for Rural Health, and the Kentucky Health Leadership Institute, which is a grant-funded entity identifying innovative ways of doing public health. Right now, we’re still kind of in our infancy. We are trying to get our feet firmly established and define who we are and what we are supposed to be doing. A: Our network members receive collective access to resources. Everyone brings something to the table. They all have value for being there and know they can get something from one another. Members also benefit from the return on investment (ROI) evaluation we were able to pay for. Not only are CHWs a darn good idea to have, but they contribute to the Triple Aim of health care: decreased cost, improved quality, and better patient satisfaction. Q: What have you found most difficult in getting started? A: We’ve been utilizing HRSA [Health Resources and Services Administration] Outreach grants since 2006. We chose to apply for the Network Development grant as a path for sustainability and replicability of our program. We wrote the grant as a way to establish training for CHWs to send them to Appalachian counties. When we received the grant, we were bombarded with network information. We’re not network people; we didn’t come into this knowing anything about networks. It’s been difficult but beneficial and insightful. However, it’s a completely new world to us. Figuring out how to bring together and operate a network is a change in thinking. A lot of the networks we interact with are on their own, whereas we operate within an agency and very much a part of public health in our county. Q: What are some of the advantages and disadvantages of working in your rural area? A: We’ve learned that in small rural communities, people wear a lot of hats, so you are asking them to put on one more. Sometimes that’s good because people in rural areas are excellent multi-taskers. Geographically transportation is difficult, and the Appalachian communities are cultures in and of themselves. Also, it’s tough to introduce new ideas to people who’ve been skeptical of change. On the plus side, it’s a tight-knit group of people who culturally support one another. People are better able to serve communities because they’re more knowledgeable and familiar with resources. Also it’s easier to develop relationships to accomplish the work. Q: What has been key to your network’s success thus far? A: One of the biggest things is being open and willing to tap into the skill sets and what other members have to offer. There’s a fairly large, nationally recognized CHW program out of Hazard, KY. It’s not exactly like what we offer, but they have a fairly comprehensive training program. We considered their training program and recognized parts we can use and other parts that need to be developed. A second key was establishing a statewide association. That’s been a huge benefit. There was a statewide CHW workgroup operating slowly. Our network gave it a boost. Now it’s back on track, and we’ve been able to give them money to bring in national CHW experts for conferences and technical assistance and that’s been beneficial to our network as well. A: One big thing identified that wasn’t initially one of our goals—but became a goal and seemed like a natural progression—is to form a statewide CHW association. It’s become one of the biggest and most successful endeavors that we’ve taken on. We realized early on that we were trying to expand CHW usage but didn’t have CHWs involved in the decision making and planning process. In a lot of conferences and meetings, that’s one of the underlying keys we heard people say: “You need to have CHWs on the ground floor. They give you the best information to help develop the program.” We’ve now had an active steering committee in play for the last few months. A: Evaluate your membership very openly. Make sure you have the right people at the table. We invited some people we’ve always worked with but weren’t the best fit for this area, so we had to establish guidelines for membership. When we narrowed down to these 22, we feel good about our membership structure in order to do the work. Understand that the network is a process, and you need to let the process occur. We realize our network is a very important piece in a movement that’s going to occur over a period of time. We may not get 10 or 20 CHWs in the next three to five years, but one or two here or there is a success, and we have to keep building on that.